Don't get too used to that hiding place, kitties. It's coming out later today. These are the latest additions to the household. 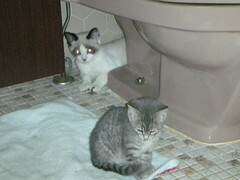 Maya is the tiny tabby and Hermes el bandito is the Burmese cross with the raccoon eyes.